You notice one day that your rabbit is scratching himself frequently. Upon further inspection, you discover tiny brown droppings in his fur. Then you spy the little insects dancing around your rabbit’s ears and nose. Yes, your rabbit has fleas. You can’t find any rabbit-specific flea treatments at the pet store, so how do you know what’s safe for your bunny? If there are only a few fleas, then a flea comb will do the trick. Thoroughly comb your bunny’s fur, and dip the comb in warm soapy water or alcohol to drown the fleas. Be sure to rinse the comb before applying it to your bunny again. In more severe cases, you can implement a rabbit-safe topical solution, which includes Advantage®, Revolution® (Stronghold® in Europe), or Program®. Consult your rabbit-savvy vet for proper dosage and application instructions. The solution should be applied to the back of the rabbit’s neck where he/she cannot lick it off. If you have more than one rabbit, they should be separated so they can’t lick the medication off each other’s backs; ingestion can cause stomach issues. Never use Frontline® or Sentinel® as flea treatments in rabbits. These medications cause adverse reactions in rabbits, including death in some cases. You should also avoid flea collars. Not only can rabbits hurt themselves trying to bite the collar off, the chemical dosage on the flea collar is generally too high. Flea dips and powders should also be avoided. Baths are very stressful for rabbits, and your bunny could go into shock. Flea powders, including all natural powders, can contain chemicals that are poisonous to rabbits. The best way to ensure your rabbit is flea-free is prevention. 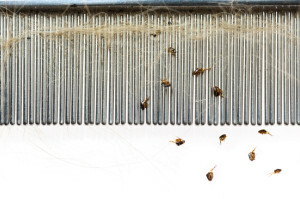 Use room sprays or flea bombs to rid your home of fleas. You can also apply boric acid such as Fleabusters® to the carpet. Just be sure to keep your bunny out of the treated area for at least 24 hours after applying any environmental flea treatment.